An old Chinese proverb says “Tell me and I’ll forget; show me and I may remember; involve me and I’ll understand.” More than any other medium, computer games have the intrinsic ability to involve their players in the world they depict; for they not only make us remember particular scenes we play, but also make us understand more of the world they involve us in. They are immersive, i.e. they make us forget the world around us, taking us away to a different place, a different life, or a different time. The game MEDAL OF HONOR: FRONTLINE is a work of fiction. Lt. Jimmy Patterson is a fictional character, like Tom Hanks’ character Captain Miller in the film SAVING PRIVATE RYAN. But as the above comment indicates, in the game one is not only invited to identify with Lt. Jimmy Patterson (or, in the film, with Captain Miller); one also has to play as the character. In that way games can add something to historical fiction that other media cannot. Or as Guardian journalist Keith Stuart put it: “games are the perfect medium for historical fiction – through their unique interactivity, they don’t have to tell us about life in previous ages, they can show us; and we can live it.” 2 Of course there are other, more tactile, ways to “live” history, such as re-enactment or experimental archaeology. But these usually are not as easily accessible as games are. Screen capture. 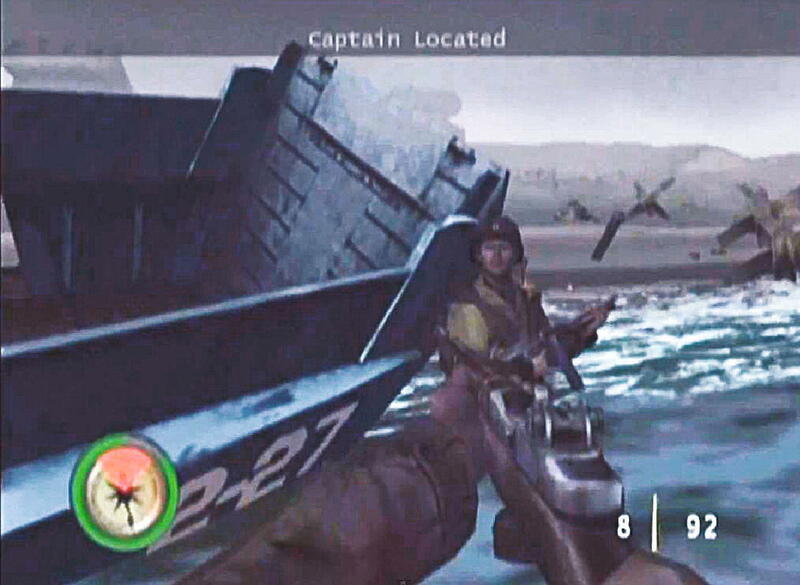 Finding your captain is one of the first tasks in MEDAL OF HONOR: FRONTLINE (Electronic Arts, 2002). Screen capture. Florence, Cattedrale di Santa Maria del Fiore (Duomo) in ASSASSIN’S CREED II (Ubisoft Montreal, 2009). Historical games can be roughly grouped into two categories: serious games and fictional games. Serious historical games are educational: their primary purpose is to teach history. In the past, such games were often produced by educational publishers or created by teachers themselves. Nowadays, educational games are often short, free-to-play games on the internet. Quite a few are produced by television channels as part of their services for schools, such as the game BOW STREET RUNNER (2008) 3 commissioned by Britain’s Channel 4. While these games take historical accuracy seriously, they are explicitly made for the general public and thus are not very demanding with respect to hardware or game skills. Often this leads to their using simple graphics and animations, giving them a cartoon-like appearance, a far cry from the more realistic graphics of commercial games. Consequently, they usually are visually less appealing and less immersive. The primary purpose of commercial historical games is entertainment, but this does not mean that they do not take historical accuracy into account. Because gamers who prefer this genre value truthful and realistic depiction, the historical accuracy of the presentation is especially important in games like MEDAL OF HONOR: FRONTLINE. The story, however, is fictional, and it depends on the writers how much factual history is included. Consequently history is usually included when it adds to the story, but most of the time it only functions as a backdrop for the actions of the fictional characters. One specific type of commercial historical game is the “strategy game.” These games, echoing nineteenth century tin-soldier war re-enactments, are specifically designed to “restage” battlefields. But, unlike the games previously mentioned, this type emphasizes the player’s managerial and strategic skills. In such games, restaging the invasion in Normandy, for example, is about troop movements, managing supplies, and trying to minimize losses. A historically accurate mise en scène is less important, since the player is more focussed on making the correct decisions needed to win the battle. Consequently, just how the battle unfolds depends on the decisions of the player, not on what actually happened. But this aspect has its own appeal, since strategy games are the ideal vehicle for “what if”-scenarios. In the BBC television program TIME COMMANDER (2003 – 2005), a strategy game was used in which two teams of players “refight” famous historical battles such as the Battle of Trebia (Carthage versus Rome). After the game, two military specialists analysed the performance of the players and explained how the actual historical battle unfolded. War is only one of the subjects presented in strategy games. Many are about discovery and settlement or about trade, again often in an historical setting. And even though they are historically perhaps less accurate than games like MEDAL OF HONOR: FRONTLINE, playing any of THE PATRICIAN GAMES (1992 – 2011) does teach one about the Hanseatic League and the main products that were traded in its various port cities. The main difference between games like MEDAL OF HONOR: FRONTLINE, and THE PATRICIAN GAMES, however, is that the former is a so-called “game of progression,” that is to say, a game in which the story “drives” the actions of the player. Strategy games are games of emergence, games where, given the input of the player, the rules of the game determine what happens next, and thus the game designer can force the player to go through certain experiences. IN MEDAL OF HONOR: FRONTLINE the player has to fight his way through the Omaha beach landing in order to be able to play on. For many, this means dying and retrying several times, hence the remark of the player at the Level Up conference. Because the designer ultimately determines what happens next, these games can include more accurate historical scenes, such as the invasion of Normandy. Apart from commercial games like MEDAL OF HONOR: FRONTLINE, where historical accuracy is important (though not as important as the entertainment aspect), there are also commercial games that use a historical time period only as a backdrop for the story and gameplay. This does not necessarily mean that their mise en scène is pure fantasy. Just as some films and television series try to give as accurate a vision of a certain period as possible, so some game producers strive for a similar accuracy in their games.4 One such a company is Ubisoft, which, with its ASSASSIN’S CREED series (2007 – present), has set a high standard in recreating historical locations. Their meticulous recreation of past eras is exactly what has made these games so successful. The periods depicted in the main games are the Third Crusade (1191), as experienced by the assassin Altaïr Ibn-La’Ahad, then Renaissance Italy (1476 – 1507) and Constantinople (1511 – 1512), as seen through the eyes of Ezio Auditore da Firenze and, finally, the American Revolutionary War (1753 – 1783), as experienced by Connor Kenway. The dedication to historical accuracy is evident from the fact that the ASSASSIN’S CREED design teams consist not only of writers and designers; they also have a team historian who is an expert on the period and historical events being depicted. This shows Ubisoft’s commitment to making the physical settings and characters as historically accurate as possible. In the first game, for instance, when Altaïr approaches the city of Acre, the discerning gamer will notice the siege marks left by Richard the Lionhearted (evidence of a historical event that took place in July 1191). Besides the many corpses, we see small palisade walls used by the siege army and buildings that have been damaged or were completely destroyed by the siege engines. Beyond drawing on the knowledge brought to the game by the team historian, the team also visits the actual locations involved, taking thousands of photographs and hours of video footage, which they then compare to historical records. For example, when doing research on Florence for ASSASSIN’S CREED II (2009), lead writer Corey May read Machiavelli’s History of Florence. Consequently, elements such as the Vasari corridor and the Uffizi were not included in the game, as they had not been built at the time. One exception the team made concerns the Duomo. Although the building itself was completed in 1436, the exterior was not completed until 1887, but since most people know the Duomo only in its completed form, the team decided to forego historical accuracy and show the building as it looks today, to make the landmark, and thus Florence, more easily recognisable for the modern player. Florence, Cattedrale di Santa Maria del Fiore (Connie Veugen, 2013). Screen capture. Florence, Basilica di Santa Croce in ASSASSIN’S CREED II (Ubisoft Montreal, 2009). Florence, Basilica di Santa Croce (Connie Veugen, 2013). Screen capture. Florence, Basilica di San Lorenzo in ASSASSIN’S CREED II (Ubisoft Montreal, 2009). Florence, Basilica di San Lorenzo (Connie Veugen, 2013). Screen capture. Florence, Palazzo Vecchio ASSASSIN’S CREED II (Ubisoft Montreal, 2009). Florence, Palazzo Vecchio (Connie Veugen, 2013). In the past few years a new type of game has emerged that uses the internet and social media: the “alternate reality game.” Imagine yourself faced with the kinds of tasks and puzzles Professor Robert Langdon was faced with in The Da Vinci Code (2003). Of course, you can do that in THE DA VINCI CODE(2007) computer game, but wouldn’t it be much more fun to be able to solve the puzzles at the actual sites, just as Langdon and Sophie Nevue did in the book? When playing an alternate reality game, you can, since it is a narrative game spread through several (social) media as well as the real world. The interesting part from a maker’s point of view is that alternate reality games can be scaled up or down depending on the environment the story is set in and, of course, the budget available. For the players, such games appeal because they resemble treasure hunts and because one usually needs other players to succeed, just as Robert Langdon needed Sophie. Of course, the success of an alternate reality game, like that of any other narrative game, depends on the appeal of the story. Here both THE DA VINCI CODE and ASSASSIN’S CREED can serve as examples. In ASSASSIN’S CREED BROTHERHOOD THE DA VINCI DISAPPEARANCE (2011 expansion set) the players find a set of coordinates that point to a particular area in New York State. On several of the many ASSASSIN’S CREED Internet forums players discussed the location of the coordinates, and those living in the vicinity volunteered to check out what was there (as Google Maps did not provide enough detail). In ASSASSIN’S CREED INITIATES, a new 2012 browser-based game, the coordinates reappear as indicating a possible hiding place. And in ASSASSIN’S CREED III it turns out that it is the site of an ancient temple which the assassins need to explore. The ASSASSIN’S CREED INITIATES game itself uses many alternate reality game characteristics to involve the player community, most notably collective intelligence. Sometimes the collective intelligence puzzles are simple, requiring, for example, the decoding of Morse code or the translation of Italian newspaper articles. But in one particular instance the fans were confronted with a Latin text which turned out to be lines from a relatively obscure volume by 17th century poetess Elisabeth Jane Weston. Fortunately, one of the players had the necessary skills to ferret this out. THE DA VINCI CODE shows how alternate reality games can be used to combine actually existing places with a dispersed 9 narrative, as when Langdon and Sophie have to travel to several historical places to finally solve the code. The initial clue could, for instance, be incorporated in a Paris tour guide. In alternate reality games these kinds of clues are called “rabbit holes,” since they lead the players into the story. Such clues could, of course, also be placed in an e-mail, on a Facebook page, on the website of a museum or historical site, or in a brochure. They could even be part of the explanatory text in an exhibition or tour. As a great many people now have a smartphones, site-based clues and puzzles can easily be combined with information to be found on the internet.10 In London (another important location in THE DA VINCI CODE), players could be directed to Temple Church to find a particular symbol on the tomb of the knight whose oath led to the signing of the Magna Carta. The symbol could then be photographed and sent to a specific e-mail address, which, in turn, leads on to the next puzzle. Contrary to the traditional treasure hunt, however, the clues should not lead to a physical award. Rather, they enable the players to piece the story’s parts together, with the final piece leading to the story’s conclusion. Naturally, the actual places, buildings, and artefacts within the alternate reality games should, ideally, also tie in meaningfully with the story, as they did in THE DA VINCI CODE and the ASSASSIN’S CREED games. Commercial alternate reality games can be very elaborate, involving thousands of players, as in the case of THE ART OF THE HEIST (2005), which was used to introduce the new Audi A3. Yet, as already mentioned, alternate reality games do not have to be quite as elaborate and expensive as these examples. Three years ago, for instance, students in the game design course at the Amsterdam University of Applied Sciences (Hogeschool van Amsterdam) were asked to design a game to familiarize children with the Amsterdam Public Library. One team designed a game which combined alternate and augmented reality. 11 They came up with the story of a cute little alien who, like ET, is stranded on earth and needs the children’s help to return home. In order to play the game, the children had to go to the library building and use the library system to find cards with QR codes. These cards could be hidden at a specific place within the building, but they could also be hidden in a particular book. Once a card was found, the children could take it to one of the library’s computers to scan it with a webcam. On the screen they saw the table on which they had placed the QR card, but instead of the card they saw the little alien talking to them and showing them how this card helped him repair his spacecraft (the augmented reality bit). When the final card was scanned, the alien said a tearful goodbye and flew away in his spacecraft. As all the physical elements, apart from the QR cards, were already present, the main cost of this game was programming the actual code and making the short films. In this case the QR codes were used to tell the story of the little alien, but they can also be used, for instance, to access short (historical) films at the actual places where the events occurred. Something similar happens in the alternate reality game LOST IN TIME (2012) by Tempeest.12 This game, which takes place in a real Dutch city, revolves around the story of a young hacker called Thijmen who has stolen a time machine (a converted iPad). Thijmen uses the tablet to travel through history. But in doing so he changes history, jeopardizing his own and other people’s futures. 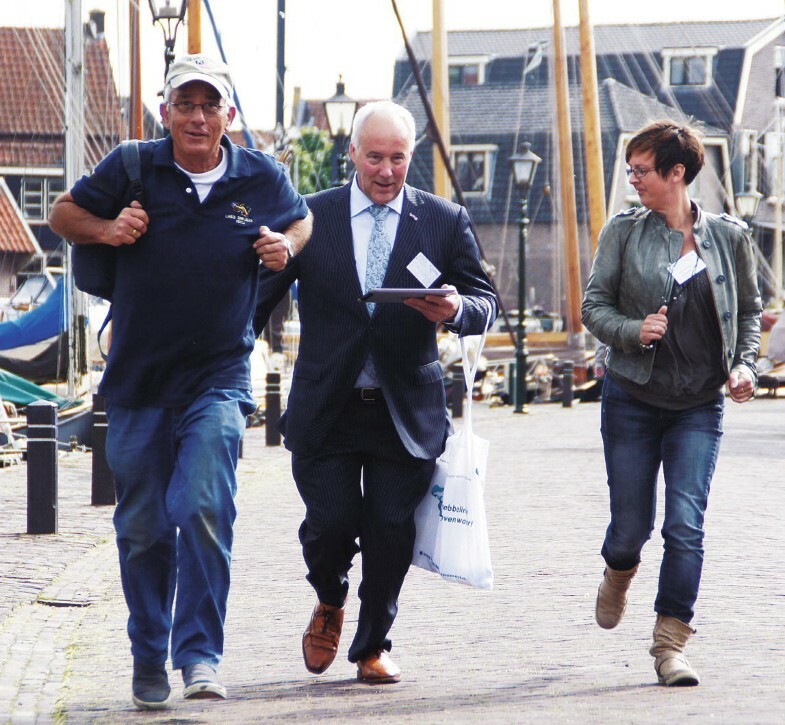 The players, also using a tablet time machine, wander (or run, depending on the mini-game they are playing) through the streets of the city trying to find Thijmen and to restore history (when they succeed). 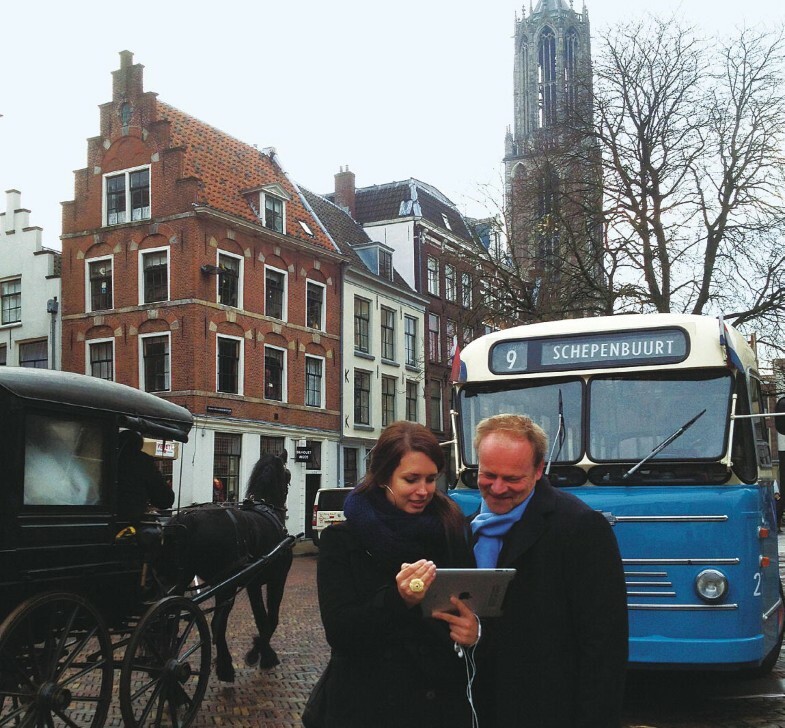 The game takes them to historical sites where videos not only tell part of Thijmen’s story, but also provide them with accurate information concerning the location. Clearly, this alternate reality game is quite similar to the previous one, relying as it does on a real setting, a computer program, and pre-recorded video fragments that play at specific locations. 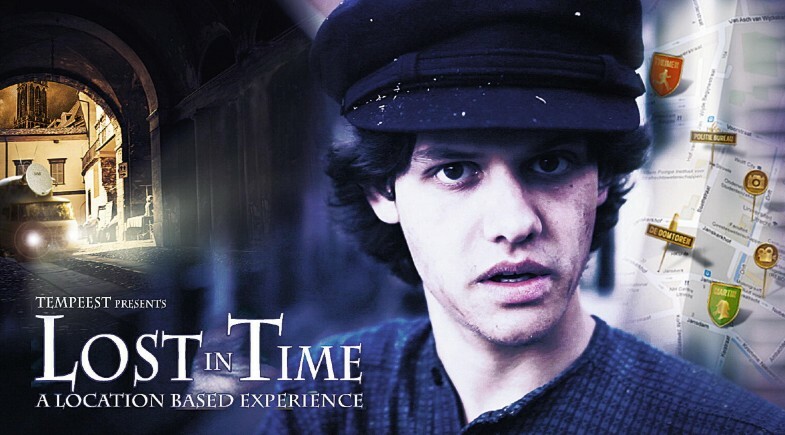 But LOST IN TIME is more interactive, because the players have to play mini-games in the city. Since the game could function as promotional material for the city it is based in, the locations and data included are determined by agreement, thus helping to assure their historical accuracy. LOST IN TIME (courtesy of Tempeest). From the above it may seem that most history-based games are about war, battles, and killing. This does hold true for a majority of the strategy games, which are our modern day equivalent of the tin-soldier war games. However, in these new games the gamer is given an overview of the battlefield, because this is the best perspective for moving armies, building defences, etc. Although actual fighting is not shown in them, games such as CRUSADER KINGS II (2012) have an age rating of 13 and older as they may contain violence and minimal bloodshed. The ASSASSIN’S CREED games belong to a genre that encompasses all kinds of subjects: adventure, science fiction, fantasy, etc. Most of these games do not rely on particularly violent plots (except, of course, those based on a horror story), and most of them are not set in the past. Players of the ASSASSIN’S CREED games do not play them because it is “cool” to be an assassin and kill people. They play them because they love the historical setting, the great stories, and the many mysteries which the games include. Ezio is the favourite protagonist of most of them, because his motives to kill are entirely credible, especially since he starts off as a trouble-free youth of 17 who does not choose to become an assassin; his destiny is thrust upon him the day his father and brothers are hanged before his eyes. As the game proceeds, however, his thirst for revenge diminishes; he grows older and wiser and, in the end, he does not kill the man responsible for his family’s cruel fate. Some of the LOST IN TIME players during a business outing (courtesy of Tempeest). Time travel in the centre of Utrecht (courtesy of Tempeest). The only game genre that actually is about weapons and killing is the “shooter,” of which MEDAL OF HONOR: FRONTLINE is an example. 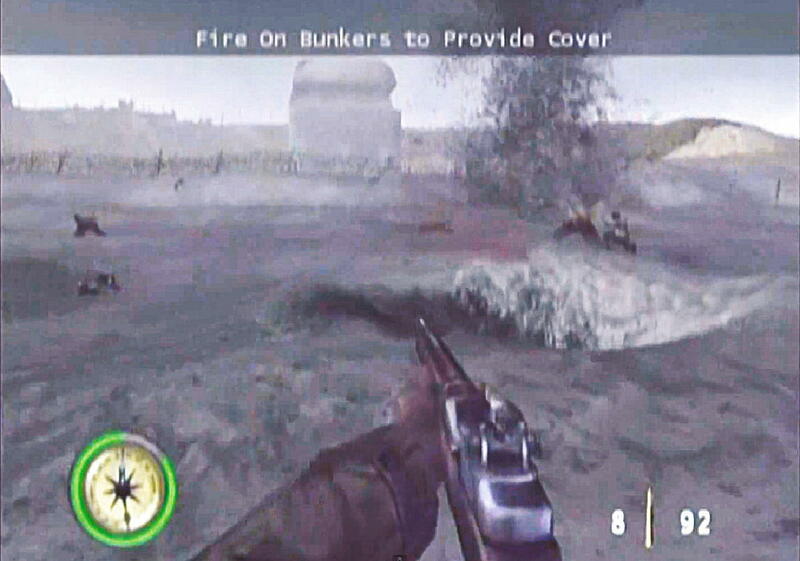 The natural environment for this kind of game is a war zone, and the two most popular series in this genre, MEDAL OF HONOR (1999 – present) and CALL OF DUTY (2003 – present) both started with a game set in World War II. Of the two, the former seems to be more historically accurate. This is not surprising given that the series was originated by the well-known film producer and director Steven Spielberg. But as the years have passed their players have become less interested in historical battles. Consequently, both series have become less focused on the historical setting and more so on fighting and warfare itself. The latest games in both series are thus set in current war zones such as Afghanistan and Somalia, and the stories now revolve around counter-terrorism. Other popular series in the genre, such as GEARS OF WAR (2006 – present) and HALO (2001 – present), are not about history at all, but take place in the future. One of today’s major pastimes is playing computer games. It is, therefore, quite understandable why games increasingly are used to interest a younger audience in history, and as the success of the ASSASSIN’S CREED’s games shows, “playing” with history does not have to be boring. But successful commercial games focused on history are not by themselves sufficient to reach this goal, as the accuracy of their historical data varies. Fortunately, alternatives such as alternate reality games are possible. 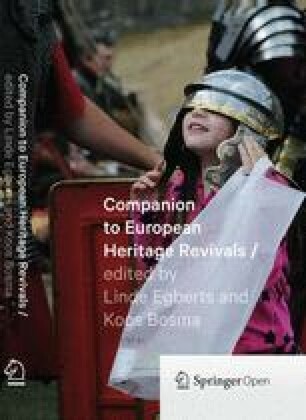 Their appeal lies not only in the fact that they are social games which can combine present and historical time, as well as data and images; their scalability also makes it feasible to create tailor-made versions of them centred on specific heritage sites.